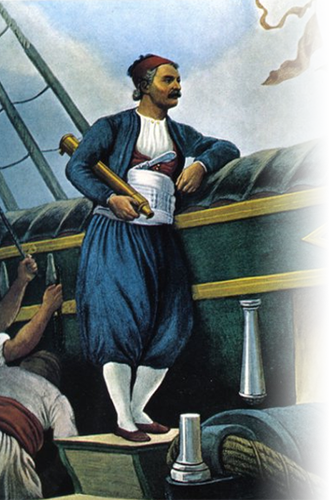 In 1802 the administrative system of the island changes with the sending to Hydra George Voulgaris, favored by the then Captain of the Turkish flagship. The period of the financial health of suppressing piracy and the inner peace that followed the times of George Voulgaris government gave the opportunity to the Hydra to organize their society as they wanted, while the constant battles that had to give the hydra crews pirates who then infested the Mediterranean, turned them over time from petty farmers and shepherds in bold empeiropolemous shipping. From Hydra was used as a naval station, thus leading role in maritime trade and communications. Flourishing trade shows in the late 18th century and early 19th. Then the Hydra took advantage of the Anglo-French war and gained huge profits by controlling sea trade. During this period, as a result of the privileges of free navigation on the cover of the Russian flag and the international context created by the French Revolution and the Napoleonic Wars, the Hydra gradually became masters of the sea routes of the Mediterranean and Hydra became the first naval power among the Greek islands. Important was the help of Hydra in the national liberation struggle in 1821. The Eve of Holy Struggle, find the island full strength, economic and military. The island had a population of about 28,000 residents, has 186 battleships ships with 2,400 guns and tonnage of 45,000 tons, manned by crews 5,400 men. Fair Ibrahim called Hydra "Little England". Hydra, Spetses with and Psara, played a decisive role in the Revolution of 1821 from the commercial and naval fleets in the service of the race. Hydra as Admiral Miaoulis, Anthony Economou, Tombazis, Sachtouris, Voulgaris, the Kriezis Tsamados, Sahin, the Vokoi Brothers, the congressman Matrozos and Pepin, and many others, promoted to leading figures in the Revolution. The revolution in Hydra officially declared on April 16, 1821 by Anthony Economou and people who overcame the reservations of notables. The Hydraiki fleet with a fleet of Spetses and Psara dominated the sea during the seven year war, thus contributing to the liberation of Greece, sacrificing many lives, ships and money and bringing leaders and activists. Intense but it was the reaction of strong effort in Hydra I. Kapodistrias abolish the privileges enjoyed the island by then. After liberation begins a long period of decline and recession on the island for about a century, Hydra despite its small size and deepening economic decline, given the politics of the country a President of the Republic, five prime ministers, many ministers. George Koundoriotis was Chairman of the Executive during the Revolution, member of the Council on Kapodistrias Othona Prime Minister and Minister of the Navy. Anthony Kriezis, Dimitrios Voulgaris, seven times Prime Minister, Athanasios Miaoulis, three times Prime Minister and Petros Voulgaris, Prime Minister of Greece. In 1912, Admiral Paul Koundoriotis, as leader of the Greek fleet defeated the Turkish fleet in the straits of the Hellespont. During the same period, on October 18, 1912, Nicholas Votsis, ruling the 11 torpedo boats, torpedoed the Turkish flagship "Fetish Bulent" 3,000 tons, in the port of Thessaloniki. In 1924, Admiral Paul Kountouriotis was the first President of the Greek Republic. In the Church, the Hydra gave Archbishop of Athens and All Greece, Dorotheus Kottaras, and the Bishops, Patsi, Paris, Epiphanius, Kalafatis and Procopius Georgantopoulos. In science and letters, gave academics A. Hardy, J. Harami, N. Hatzikiriakos-Gikas, P. Tetsis and painter N. Nikolaou. Hydra was developed and adopted its current format in the last decades of the 18th and early 19th century. Then, the old city of Kiafas abandoned and residents gathered around the Monastery of the Assumption, in the harbor, which, together with a portion of the old city, created the modern city. The 20th century finds Hydra despite the temporary economic recovery - the result of the systematic engagement of residents in fishing and trade sponges - a full population weakened, driven slowly but surely on the verge of economic stagnation. The provisional "driving" force, sponge, found the time to complete decline, mainly due to the limitation of financial support for businesses of making sponges by the Agricultural Bank of Greece. Many residents leave the island and move to Athens and Piraeus, around the Church of St. Nicholas, creating their own community. One last opportunity for growth and rejuvenation of society of Hydra was up to the 50s when the various artists and filmmakers "discover" Hydra and use it liberally in their films. Direct consequence of the rapid economic and tourist traffic to the island, which has evolved since then into a cosmopolitan tourist resort. In the '50s was made here the movie "The Boy on a dolphin" with Sophia Loren and Hydra became known internationally. Among the best known films shot in Hydra is the famous "Girl in Black" by Michael Cacoyannis and Ellie Lambeti , who won amazing reviews in the European festival. Also the film "Phaedra" of Jules Dassin's with	Melina Mercouri and Anthony Perkins and renowned Ralph Ballone.